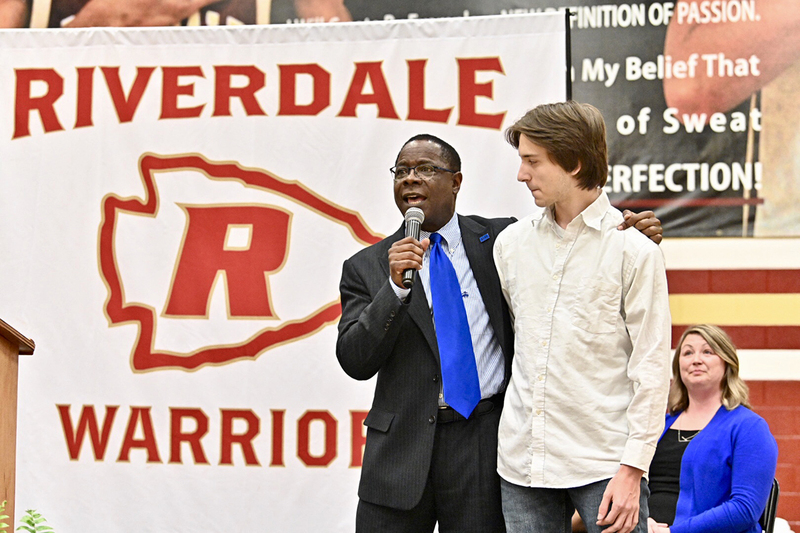 Places Your Student ID Can Get..
MTSU President Sidney A. McPhee helped congratulate nearly 500 Riverdale High School seniors Friday, April 5, at the school’s inaugural College and Career Signing Day event in the Johnny Parsley Memorial Gym. 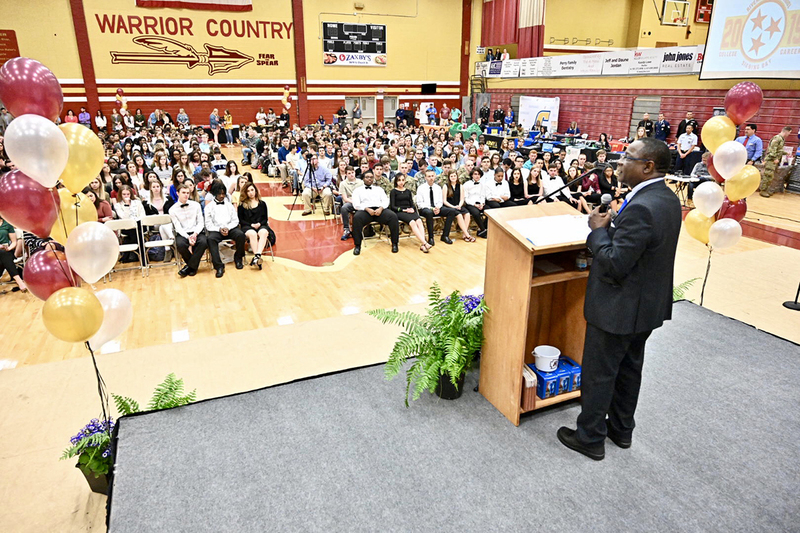 McPhee, who was invited as the keynote speaker, said he wanted “to recognize and celebrate the important decisions made by so many in Riverdale’s 2019 class of graduating seniors to continue their studies beyond this magnificent high school by attending a higher education institution” and other career choices. 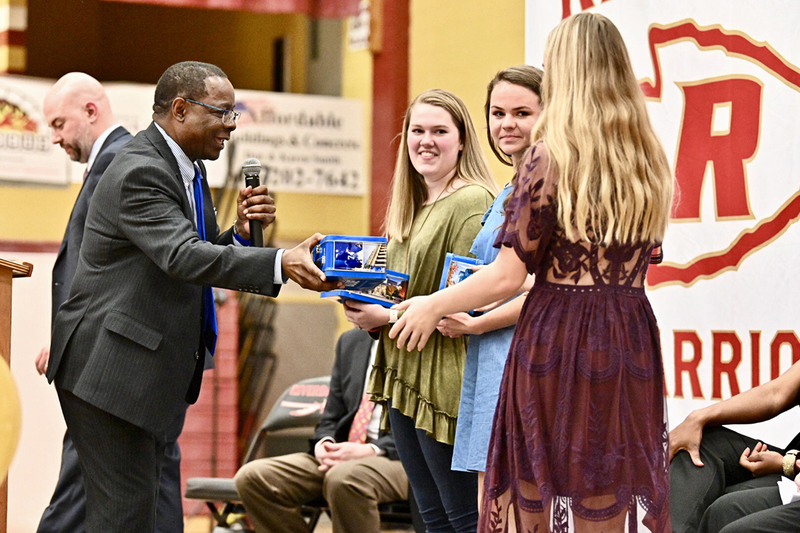 Riverdale chose to honor and publicly celebrate all of its seniors for their postsecondary choices and accomplishments. Organizers honored students who have committed to serve in the military, those who’ve already acquired skills to help them become successful leaders in the workforce, and those who plan to purse degrees at a Tennessee College of Applied Technology, community colleges and four-year colleges and universities, including MTSU. “Apply yourself, take advantage of every opportunity and don’t waste time. When you’re waiting five minutes for a friend, take time to read a book,” McPhee said to the attentive and enthusiastic audience, which also included included Riverdale parents and family members, faculty, staff and others. “For those of you planning to attend MTSU, you’re going to get the full attention of our faculty, staff and administration,” McPhee continued, noting that 130 Riverdale students have already been accepted into the Class of 2023. The president received applause when he mentioned an NBC Nightly News story that aired in February about the university’s Department of Recording Industry Grammy connections. McPhee also told the crowd about this week’s campus visit by Siemens officials thanks to a huge in-kind software grant to the Department of Engineering Technology‘s Mechatronics Engineering Program; the recent Department of Aerospace-Delta Propel partnership that will allow the airline to hire professional pilot majors who meet job and training requirements in a much quicker turnaround time; and this weekend’s trip for students and administrators to the Academy of Country Music Awards in Las Vegas, Nevada. 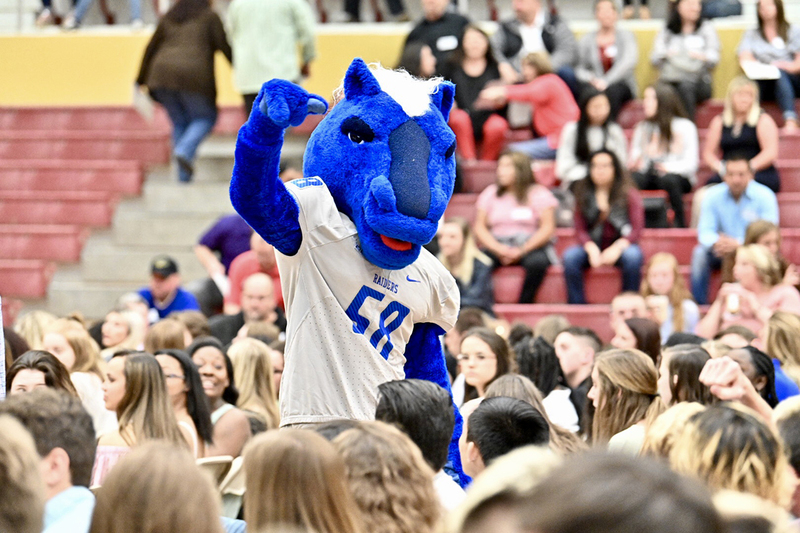 MTSU mascot Lightning mingled with the audience and posed for photos with the president and students who’ve applied to and been accepted by the university. MTSU was among several universities represented at Riverdale’s event.